Carlos Ferrando is a creative genius born in the city of Valencia, Spain. As a child, Carlos used to fill reams of notebooks with ideas for products he wanted to develop. Yet these notebooks, along with his creative instinct, got pushed aside for two decades as he pursued a ‘real career.’ After studying Industrial Engineering at Polytechnic University Valencia (1996-2003), Carlos served as Product Manager and Supply Chain Operator for various manufacturing companies in Spain. After seven years, he went to see a life-coach who reawakened him to his true calling: entrepreneurship. Wasting no more time, Carlos pivoted to product marketing and obtained a Master’s Degree in Sales from the Lancaster University Management School at age 35. Today, more than 200M people worldwide bike as their preferred mode of transportation in cities, yet only 24% of urban cyclists use a helmet (European Commission, Mobility & Transport). 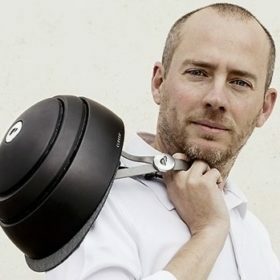 Aiming to change this, Closca has developed a one-of-a-kind foldable helmet that people want to wear and carry. Capable of shrinking by 52% in size, Closca’s 100% safety certified and patented “Fuga” helmet has gained brand recognition and worldwide adoption thanks to partnerships with high-end designers and boutiques like the MoMa Design Store, Adidas, Paul Smith, TED and more. Closca is a company committed to bringing style and innovation to avid cyclists. It is dedicated to making commuting easier and convenient without jeopardizing your flair creating a foldable bike helmet which is as attractive as safe. Closca believes in bicycles, not only as the best mean of transportation for cities but also the most beautiful. Their aim is to encourage as many people as possible to adopt a stylish two wheeled approach.